Standing tall and proud in the center of downtown Durham, 21c Museum Hotel Durham- MGallery is a multi venue contemporary art museum offering more than 10,500 square feet of art filled exhibition and event space, a full service boutique hotel with luxurious guest rooms, and home to Counting House restaurant. Durham is an incubator for vibrant arts and culinary communities. You won't have to venture far from the hotel to find a variety of things to do; whether you're a cultural connoisseur, foodie, or sports enthusiast. 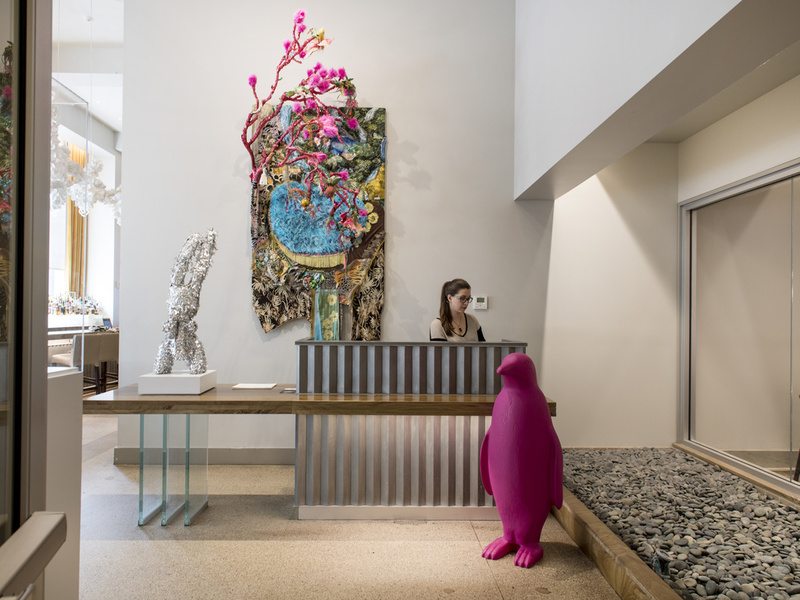 AAA Four Diamond hotel that combines contemporary art with luxurious, southern hospitality. Located in the heart of downtown Durham/City Center close to Duke, DPAC and restaurants. The 125 guest rooms are spacious with high ceilings, large windows, and custom furnishings, providing a respite to the stimulating museum spaces below. Design team preserved the foyer's green marble and silver leaf ceiling and terrazzo floors throughout. All guest rooms include Free WiFi, 42" HDTV Television, Fully Stocked Minibar, Nespresso Coffee Machine, Alarm Clock/Docking Station, Malin and Goetz Bath Amenities, Luxurious Bedding, and Original Artwork. Features regional dishes and North Carolina's heritage of fresh seafood with menus that feature rotisserie and roasting techniques. Space highlights the building's original features and rotating art exhibitions. bar and lounge at Counting House is an inviting place to explore the rotating selection of craft beers on tap, sip on housemade cocktails and aperitifs, or enjoy a smart selection of old and new world wines.